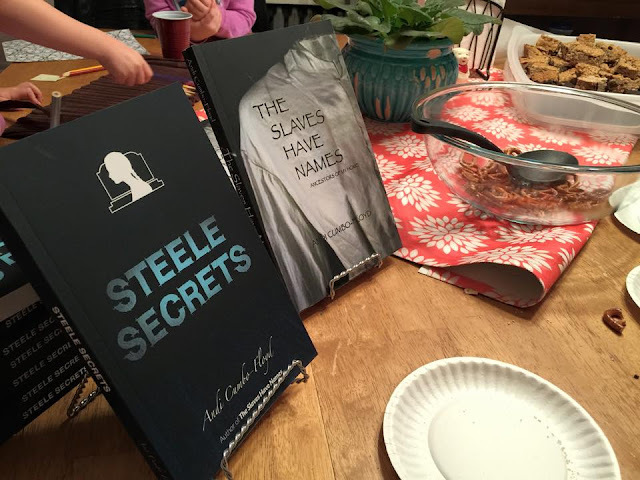 This past weekend author and editor Andi Cumbo Floyd came and gave a reading of her new novel, Steele Secrets at our house. You can learn more about Andi and her work here. Nine kids tromped up and down the stairs at random intervals, leaving a trail of fallen pretzels in their wake. Adults sat in a circle of furniture listening politely and with interest to the author’s introduction. Someone fell on the stairs, someone else fed a handful of pretzels to the dog, and the kids continued to swirl as kids do, moving in clumps throughout the house. Then the reading began. The story slipped like spider silk from the author’s lips, spinning a web over the room as words danced from corner to corner. The children paused and grew still. Drawn like magnets, their bottoms settled along the stairs, faces peeking through the railing. As the story grew, my two oldest kids burst into the circle of adults. First Solomon came and backed himself into my lap. My arms settled around his middle like a seat belt. How long has it been since he sat with me that way? He stayed there through the whole chapter, tucked into me, even though his best friends from church and school were there too. By the time we got to the part about the ghost, Sophia flew into the circle and belly flopped on the carpet. Story applies a centripetal force on its hearers, drawing us closer and closer to the source. Even the most wily among us - children and adults - are not immune to its powers. This is what I'm thinking of this week as we head into one of the Christian church's most storied times of the year - the power of story to draw us to the teller, to still our souls and bodies, to open doors we didn't know were closed. When the chapter ended, the reading ended, the spell broke and the kids scattered like dandelion fluff, consuming more pretzels, begging for another brownie and clamoring up and down the stairs again. Almost as though they'd never stopped. This here is powerful, Kelly--> "the power of story to draw us to the teller, to still our souls and bodies, to open doors we didn't know were closed." May this story fall on us fresh, drawing us ever closer to the Teller! Wonderful thought! Story is so important. Our family has read so many books aloud over the years. When my kids were young it was a big part of our lives and we continued it even as they became adults. Now most are out of the house and we don't do it as much, but I can attest to the power of story to draw you together, to open you up, etc. Thanks for this lovely peek into your evening with Andi! Blessings! Yes, we're big read-aloud-ers too. I will miss that when the kids get older. I truly believe that this drawing and quieting power of story is the only way that I survived my crew of four boys. Whenever the bedlam and decibels reached unbearable levels, all I had to do to quiet the universe was grab a book, sit on the couch, and I was surrounded by listeners. How wonderful that you are creating such a rich environment in your home! Me too, Michele! I read us through the winter every year. I felt drawn in to YOUR story here along with the ones where the children and adults came still and listened and heard. You did that with me. Being a teacher and librarian, I JUST loved it that the kids came along and sat still, cuddled where they know that stories are safe. All good. Yes, maybe they recognize the safety and spaciousness of story, recognize it as a welcoming space. Thanks for commenting, Linda. Great stories are like a spell. We enter and and time stops. Only when it's over do we return to our original rhythms. It is a gift to captivate other so. I'll have to read more of Andi's work. I love the gathering you've collected here. Kindred souls indeed. Thanks, Lisha. Yes, Andi is doing some great work, especially around race relations and the history of slavery. I just love this beautiful story about stories, and especially love how Solomon came to you and sat on your lap, and how you wrapped your arms around him like a seat belt. Beautiful! Thanks, Kathy. Sitting with him was my favorite part of the whole weekend. I love how the telling of a story brought a sense of calm and peace to all the hearers, and brought your children close in to you. Powerful indeed. May the greatest story ever told bring us all into His lap this week. Beautiful, Kelly! Thanks so much for sharing this!